Jim from Michigan wrote in to ask "Do you hunt?" I have recently come to the conclusion that hunting around here makes good economic sense if you're a meat eater in this region and you have a freezer. We are in the process of shopping for a more suitable gun and have come to a bit of a fork in the road. 40 caliber or 9 mm? Any feedback from our readers would be appreciated. The main factor in choosing to hunt is wanting to take an active part in the deer management problem in these parts. Another big reason is the self sufficient element of not relying on the grocery store for all your protein needs and having a desire for a more pure meat experience. I guess one more reason would be to someday enjoy a wild turkey dinner since all the hunters I talk to keep going on and on about how juicy and tasty a wild turkey is compared to the farm raised ones you get at the store. I know everybody has heard this before, but I'm going to say it again. Keep all firearms well out of reach from any cats you may have hanging around your place. 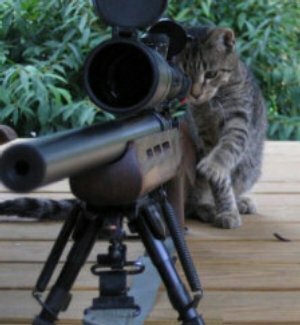 A cat cannot be trusted with a gun of any type. It's a well known fact that a dog would never even think of shooting its master...but a cat...well let's just say that a cat's loyalty is sometimes shaky at best.